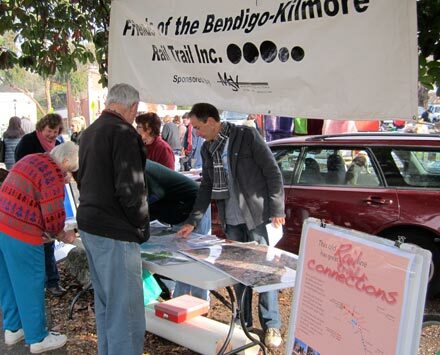 The Friends set up a stand at last Saturday’s Heathcote Bush Market and talked rail trail to anyone who was interested. And there was a lot of interest. Works on the Heathcote end of the rail trail are due to start in July or August which made for some exciting news to pass on to locals and visitors alike. Our impromptu display of historic photos also prompted much interest from people whose families had lived in the district for generations. There is a lot of history walking around in certain heads. Market-goers examine the maps provided by the council showing the proposed routes through Axedale and Heathcote. 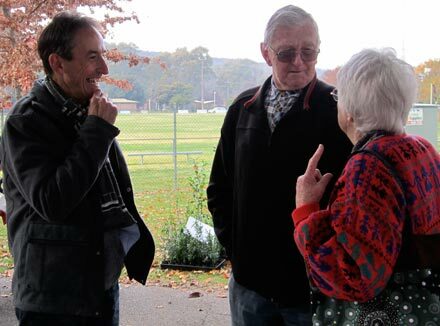 President of the Heathcote Historical Society, Ian and his wife Marion spent a long time talking to Garry. Ian’s family has farmed at Derrinal for three generations and he well remembers the train line.